Do you ever stop and ask yourself “why the hell not?” Is there really such a thing as a special occasion? When is it a good time to follow your heart? If not now, when? 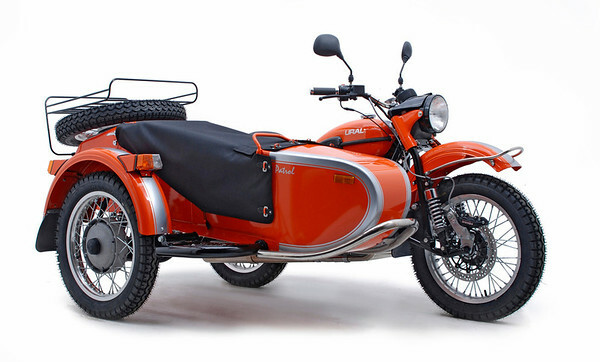 A 2012 Ural Patrol in orange & silver. You’ll be glad to know that it matches my favorite purse. For years I’ve kicked around the idea of a Ural, halfheartedly. It has always been one of those whims, those someday that would be cool sort of things. Never something that I researched or pursued. But, you know? Life is so unpredictable. Maybe someday down the road I wouldn’t have the money or the inclination or the resources to do it. So, I figured, why the hell not? If not now, when? On Sunday morning I mentioned to Kenny and Chloe that I was thinking about buying a Patrol. I kind of imagined my thoughts would have been met with something along the lines of “you what?” Instead, they were welcomed warmly with great enthusiasm. I think Chloe is more excited than anyone. My family is hands down, the biggest supporters of any of my hair-brained schemes. I’m very fortunate that way. Last night to finally seal the deal of whether or not this was something I could or should do, I took a test ride on Catfish’s Ural. He told me point blank that it would be a love or hate affair. He wasn’t kidding. I could absolutely see why someone would hate it. And, how it could quirkly charm the pants off of you. After reading for the past two days all about what it is like to pilot a sidecar rig, nothing could have prepared me for what it actually felt like. Terrifying but exciting is the best description I can muster for now. It would do me a world of good to take a sidecar class but I haven’t found anything remotely local yet. If you have any resources or recommendations, I’d be happy to hear them. I’ll need lots of practice learning the ways of this machine. I haven’t the slightest idea how this journey will unfold but I sure feel like finding out is worth the gamble. If I don’t like it, don’t want it anymore…I can sell it. But at least I will have given it a shot and I don’t have to sit back and wonder what it might have been like. My orange egg is set to hatch on September 25th. That’s when it arrives from Russia, apparently. (I never imagined typing those words) Unfortunately because of the Void Rally, I won’t be able to get up to Massachusetts to pick it up for nearly 2 weeks after that. It’s going to be a long wait but it’s just one more thing to look forward to. Follow your heart, people. If not now, when? You continue to be truly awesome in yet another endeavor! Can’t wait to hear more about this new ride. Are you going to name him/her? I don’t know if it will have a name. I’m thinking it will let me know after I pick it up. Geez, Fuzzy, stop being so damn cool … I’ll never keep up!! You are going to OWN the bike that you and I would both normally chase after to take a picture. Congrats! I can’t wait to see pics/vid! Really cool! Now you can ride regardless of the weather. I can’t wait for the review. I haven’t the slightest idea how much money or what is involved with fitting a sidecar to and existing moto. Would the temps where you are be rideable all winter or would it just extend your season a bit? About $700 for a subframe and $5K for a new car plus steering mods, lighting, etc. With the Ural you get it all plus reverse and 2WD! With a 2WD rig I think that almost all year would be rideable. Maybe not when it’s -40 but the snow shouldn’t be an issue. It looks like EverydayRiding has his out all winter and their temps are worse than ours. Gotcha, so it isn’t “cheap” to outfit your current bike by any stretch of the imagination. Well, Richard – if it is something truly in your heart, I hope you find a way to make it happen. FG that is so cool! I have been playing with the idea of a Ural as well. Looking forward to reading about your adventures on it! Will definitely read those threads in-depth. I just scanned the pics and… wow. Love that sharky paint job! Remember you wont be able to split lanes anymore other than that, congrats! I did find a place where I can take a class but it’s a couple hundred miles away :-/ I’ll have to see if i can go there and use their rig. Congratulations! There are lots of Uralistas on the net so you shouldn’t have any trouble getting advice/help on your new toy. I’ve always liked the idea of owning one myself, so when I win the lottery this is definitely one acquisition that will not wait. Enjoy! I’ve been reading and reading and reading and I know I haven’t even scratched the surface. Congrats!! That thing looks like its going to be a lot of fun!! Please tell me Luna will be riding monkey with her doggles. OH the breeze is just fantastic. Really. Wow, I can’t even tell you how apropo your post is. Just this evening I was at the BMW dealer negotiating an r1200r classic that I don’t really need. I shook on it with the dealer this evening, but won’t be signing papers until Thursday and on the whole car ride home I kept debating the whole thing. This really sort of set my mind at ease. Lovin’ it. Orange is my favourite colour! Good philosophy: If not now, when? Looking forward to Igor’s (?) arrival and maiden voyage. Thanks, Sonja – Waiting for it to arrive is so hard! You are so RAD! Totally cool ride! I have alweays wanted an orange bike with reverse gearing so I’m quite jealous in a light hearted sortb of way. Unfortunately, they are quite expensive over here and registering 2 bikes (and a car) is a big enough expense as it is. I’d also be a bit concerned about reliability. Ride it in good health! Wow welcome to a whole new type of motorcycling the old school cool way. I dont know how reliable they are but in the pictures they look as reliable as an old Royal Enfield. Good to work on and ride. Wow that is sweet. Now i want a Ural after I get that Bonnie :). My first impression reading this was ah ha, well played Miss ‘Galore, you had me going! Awesome. Congrats Fuzzy. I bet you have entirely too much fun with it and Chloe will enjoy sitting back and relaxing in the side car. Looking forward to seeing pictures and hearing your review on it. I can hardly wait to get acclimated on the thing and get out to putt-putt around with Chloe. And she is just about to go bananas with having to wait for it to arrive. Congrats; looks like a great addition to your stable! The all-weather possibilities are intriguing. If my wife sees that, she’ll want one so we can take our dog along for rides. So far it seems that people I’ve spoken with are more interested in taking their dogs for rides than they are other people! Very cool, I’ve always sort of liked the sidecar thing. Always wondered what it was like to ride one. Maybe someday I’ll have to check one out. The Retro Roadmap Meetup in Quakertown, Pa.